For a plethora of health and skin benefits you can’t beat beets. We recently shared recipes for Sweet Potato Fries (a healthier take on the summer staple) and Watermelon Salad (a seasonal favorite that’ll keep you glowing from the inside out), but now we’re ready to fire up the oven for “Beet Carpaccio.” You read that right: beet not beef. Way healthier and more eco-friendly, but still a great source of iron, not to mention delicious and satisfying. 2. Wash and scrub your beets. 3. Place them in an oven safe baking dish/pan, drizzle with olive oil, sprinkle with salt and pepper. Place thyme sprigs all around the pan and cover the whole situation with foil. 4. 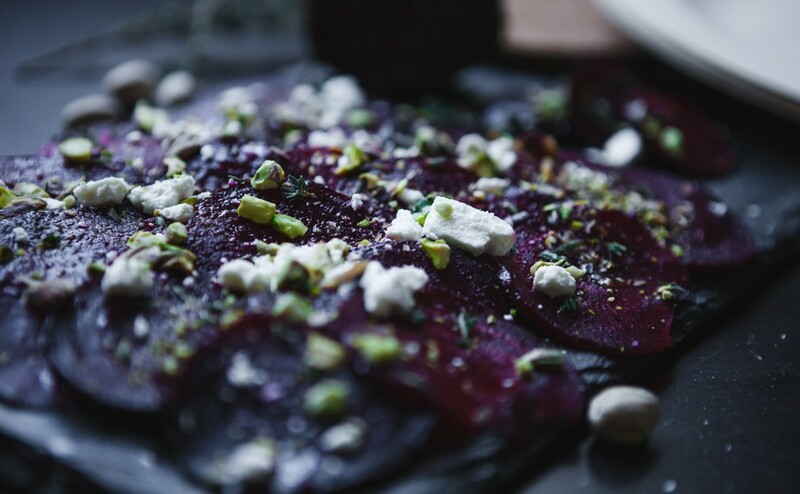 Bake the beets in the oven for about an hour, then test them with a knife – you’ll know! 5. Let the beets cool with the foil still covering the pan as this will make slipping them out of their skins easier. 6. While the beets are cooling, remove a handful of pistachios from their shells and smash them under the flat side of a chef’s knife with the bottom of your fist (fun! ), then use the sharp side of the knife to chop some of them into even smaller bits. 7. Once the beets have cooled and you’ve removed the skins, slice them as thinly and evenly as possible and arrange them attractively to slightly overlap each other. 8. Drizzle with olive oil, sprinkle with salt, pepper, crumbled cheese (should you opt for it), the leaves from the thyme sprigs that were in the oven and the crushed pistachios. 9. Munch to your heart’s content! Though eating well will keep you looking good, we can all use a little extra help at times. Whether you’re recovering from a long night, a long week, hectic travel or whatever life has thrown your way, the “Post-Game Pretty Pack” is here to help. It hydrates your skin to fade signs of fatigue while restoring and replenishing Vitamins A, D and E and revitalizing weary skin by increasing blood circulation.